Webster University recognized its loyal supporters at the Donor Recognition Dinner on Nov. 9. 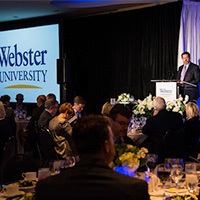 The successful evening highlighted the crucial role of donors’ to the success of Webster University and also celebrated the University’s successes. Held in the Starlight Room at the Chase Park Plaza Royal Sonesta Hotel, the dinner featured talents from the Community Music School of Webster University (CMS). A jazz quartet of CMS students delighted guests during the evening reception, and before dinner, 10-year-old CMS piano student Jerry Chang and CMS voice instructor Caroline Corrales '16 impressed the crowd with several moving pieces. Donors play a crucial part in Webster University students' success. Highlights of the event included honoring Arden and Harry Fisher with the 2017 Visionary Award. The Fishers’ dedication to the Community Music School has inspired hundreds of young musicians. In addition, special recognition was given to Betsy Schmutz for years of services to Webster University as chief Human Resources officer and associate vice president. Brenda Fyfe, dean of the School of Education, and Laura Rein, dean of Library Services, were both awarded the title of dean emeritus. Left to right: Student Ambassadors and Provost Schuster presented Betsy Schmutz with special recognition for years of service, and presented Brenda Fyfe and Laura Rein with dean emeritus status.